Birthday Balloon with AGE - Gifts - Balloons - Perth Florist Perth in Western Australia specializing in flower delivery of roses and wild flowers. 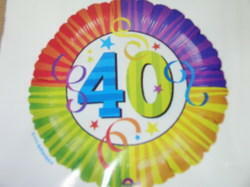 45 cm foil Helium filled balloons are available ONLY as an accompaniment to floral or gift deliveries. Birthday ages available are first birthday(in boy or girl), then 16th, 18th, 21st, 30th, 40th, 50th, 60th, 70th, 80th, 90th and 100. There are a number of designs for each age. We will choose one to match the colours in the balance of your gift.